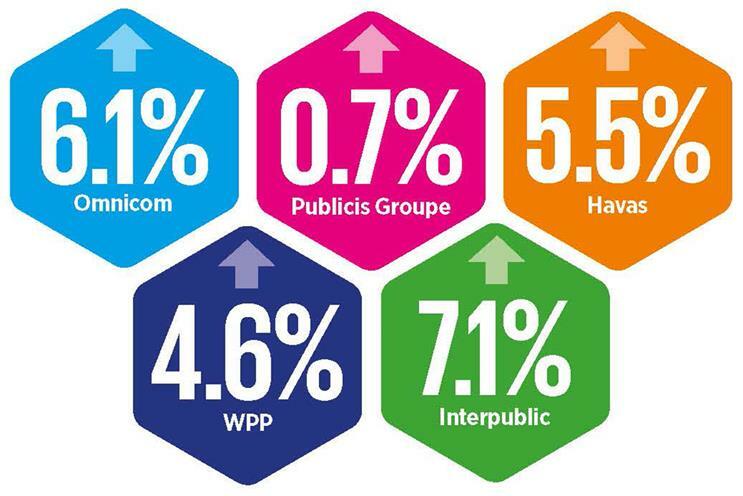 Publicis Groupe is the "outlier" among the big holding companies' third-quarter results after posting organic growth of just 0.7 per cent. The owner of Saatchi & Saatchi and Starcom Mediavest Group reported a 33 per cent year-on-year rise in revenue to €2.3 billion (£1.7 billion). But Ian Whittaker, the head of European media research at Liberum, told Campaign that he was concerned by its limited organic growth. He said: "The one [holding company] that stood out in terms of disappointment is Publicis Groupe. "It is hard to know what is going on but, looking at the numbers, it is far worse than the other players in the market." Maurice Lévy, the chairman and chief executive of Publicis Groupe, attributed the sluggish figures to "an unusually large number of clients downsizing their accounts and postponing or even cancelling campaigns". Omnicom’s worldwide revenue dropped by 1.1 per cent to $3.7 billion (£2.4 billion), compared with the same period last year, but grew organically by 6.1 per cent. Havas posted organic growth of 5.5 per cent, and a 15.4 per cent increase in revenue in the third quarter to €516 million (£373.9 million). Interpublic’s revenue was up 1.3 per cent year on year to $1.9 billion (£1.2 billion), including organic growth of 7.1 per cent. WPP’s revenue for the three months ending 30 September grew 5.9 per cent to £2.9 billion. Like-for-like revenue was also up, by 4.6 per cent, and net sales by 3.3 per cent.